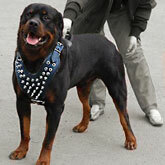 Welcome to Rottweiler Dog Online Store where we offer a great variety of harnesses for the Rotties. 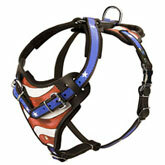 We offer harnesses for you beloved pets of any age and size. 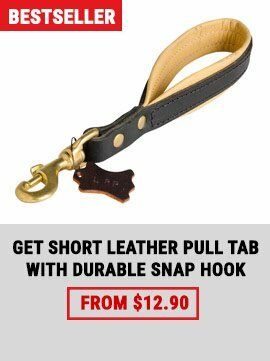 If you need durability and guarantee of quality, pay attention to leather dog harnesses. 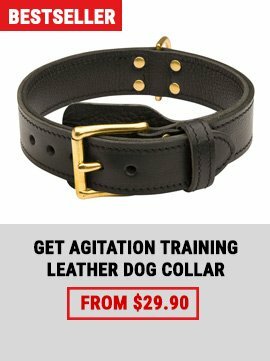 Natural leather is a guarantee of strength that withstands the power of your pet and helps to develop his natural abilities. 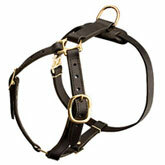 Also we can offer you top quality, light and very compact nylon dog harnesses. All dog harnesses, we offer, are made of high-quality materials that have a good water and dirt resistance. Interior soft padding provides your pet with full comfort. Comfortable design helps to put the harness on and off very quickly. Stitched reflective strap will ensure your dog's safety in urban areas. 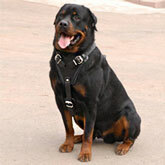 Rottweiler leather harnesses are made of specially selected leather that guarantees their long life service. All metal parts of our harnesses are made of quality alloys that provide the products with fantastic reliability. Also, in our store you can find rather exclusive products. 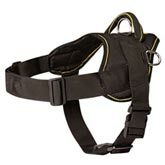 There are special dog harnesses for search/rescue and veterinary purposes. There are patent models of dog harnesses for professional dog training. The use of such harnesses will emphasize your professionalism, help in the work and prove your love and care to your four-feet friend. A dog harness is a type of dog equipment that helps to control a dog properly, make him sledge and develop his strength and staying power. Dog harnesses are made of different materials such as ordinary cloth, tape, nylon, canvas, velour, natural and artificial leather. It is very comfortable to use a special harness which prevents pulling of a leash, if your doggie is very active while walking. If the harness fits properly, it will help even a child to cope with a large dog. 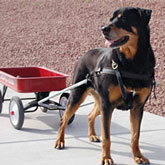 At the same time, an ordinary walking harness can’t be used for walking a disquieted, aggressive Rotty. It is rather difficult to choose harnesses because a good harness should fit snugly to the dog’s body and not to sag. Otherwise the effectiveness of the harness will be reduced significantly and your pet will feel discomfort. Also, pay attention to the balance of harness and the dog’s strength. You shouldn’t economize on cheap models. Such cheap harnesses are usually made of low-quality materials, serve a short period of time and can harm a dog. 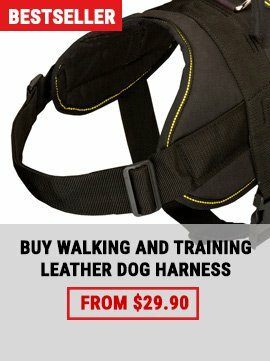 Compare the size and strength of your doggy with durability of the harness you want to purchase. Recently, many harnesses have special patches with a reflective trim that will make your dog noticeable for you and drivers at night. Remember that you shouldn’t use the harness all the time. The main reason is that after wearing of a harness, a dog feels discomfort with a collar and a leash on (because of the center-of-gravity shift). To choose the material and form of the harness correctly, first, determine the purpose of the use. 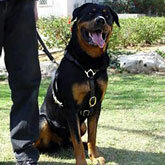 Choosing a harness for service Rottweilers, pay attention to leather harnesses with wide straps. Check all fittings and stitching of straps. If you are looking for a racing dog harness for towing a skier, choose a nylon pulling dog harness or a leather pulling training harness. They don’t have fittings, are properly stitched and very light-weight. 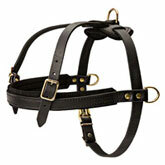 The main feature of such harnesses is that they are equipped with a cord to be attached to. Sometimes, they are equipped with additional elements for fastening (e.g. for a team of dogs). 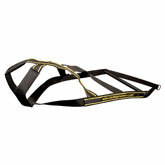 There are many harnesses for muscle-strengthening exercises and competitions. They are used for a short period of time but very often and should be extra durable. Also, there are dog harnesses with additional cargo option. Such harnesses allow developing the staying power gradually, and help in rehabilitation after fractures. The additional cargo can be removed what helps to choose a correct weight. 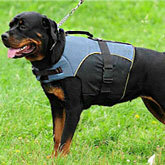 Harnesses are irreplaceable items for dogs with thick necks like Rottweiler breed has. For these breed it is better to use harnesses than collars. Your four-legged friend will breathe easily and such supply doesn’t harm his neck and larynx. Usually, such dog harnesses are made of light-weight materials. 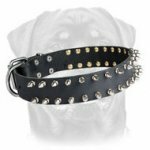 It can be either nylon or full grain leather harnesses, decorated studded harnesses or spiked ones. Such harnesses are often sold with a leash of the same color. There are dog harnesses which should be mentioned apart. They have specific construction which allows lifting a dog up. Such types of harnesses are usually used for dogs that hardly move or can’t move without assistance (because of injury, age, other health reasons). 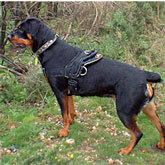 So, the main criteria for choosing a Rottweiler dog harness are: sphere of use, dog’s dimensions, his body size, usability. The price of the harness should be on the last place because a cheap harness can harm your pet very much.